President Barack Obama will veto a bill approving the controversial Keystone XL pipeline if it passes Congress, the White House has said. It is the first major legislation to be introduced in the Republican-controlled Congress and a vote is expected in the House later this week. Spokesman Josh Earnest said the legislation would undermine a "well-established" review process. The $5.4bn (£3.6bn) project was first introduced in 2008. Environmentalists are also critical of the project, a proposed 1,179-mile (1,897km) pipe that would run from the oil sands in Alberta, Canada, to Steele City, Nebraska, where it could join an existing pipe. 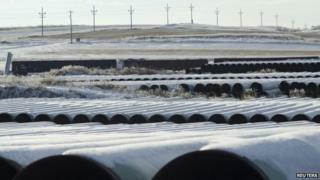 And the project is the subject of a unresolved lawsuit in Nebraska over the route of the pipeline. "There is already a well-established process in place to consider whether or not infrastructure projects like this are in the best interest of the country," Mr Earnest said on Tuesday. He added that the question of the Nebraska route was "impeding a final conclusion" from the US on the project. Despite the veto threat from the White House, the bill sponsors say they have enough Democratic votes to overcome a procedural hurdle to pass in the Senate. "The Congress on a bipartisan basis is saying we are approving this project," said Republican John Hoeven, one of the bill's sponsors. But Mr Hoeven and Democratic Senator Joe Manchin said they would be open to additional amendments to the bill, a test of the changing political realities of the Senate. Democratic critics of the bill are said to be planning to add measures to prohibit exporting the oil abroad, use American materials in the pipeline construction and increased investment in clean energy. It is unclear if those amendments would gather the two-thirds of votes needed in both chambers to override Mr Obama's veto.